Christian missionaries, with his writings forming a considerable portion of the New Testament. His influence on Christian thinking has been of utmost significance due to his role as a prominent apostle of Christianity during the spreading of the Gospel through early Christian communities across the Roman Empire. Previously known as Saul, he persecuted Christians as heretical. Saul even assisted in the stoning of Saint Stephen, the first deacon who martyred for his beliefs. On his way to Damascus to arrest another group of Christians, he was knocked to the ground, struck blind by a heavenly light, and given the message that in persecuting Christians, he was persecuting Christ. Now that he was blind, he could really "see" the truth. He was baptized and changed his name to Paul to reflect his new persona. He was beheaded because of his faith. Saint Paul is a role model for all of us. Do we sometimes persecute Christ in one form or another? St. Paul's conversion was very important for the life of the Church. We are reminded of the fact that the Lord looks for us, too. He finds us along our Damascus road. He invites us to give up the things in our lives that keep him away. Will we recognize Him as Paul did? Will we be willing to become real followers of Jesus as Paul was? Let us ask St. Paul to help us. May the intercessions of St. Paul be our refuge. As a youth he went to Jerusalem to become immersed in the Law and had as a teacher the celebrated Gamaliel. He acquired skill as a tent-maker, a work he continued even as an apostle. At the time of Jesus' ministry he no longer was at Jerusalem; neither did he see the Lord during His earthly-life. Upon returning to the Holy City, Paul discovered a flourishing Christian community and at once became its bitter opponent. When Stephen impugned Law and temple, Paul was one of the first at his stoning; thereafter his fiery personality would lead the persecution. Breathing threats of slaughter against the disciples of Jesus, he was hurrying to Damascus when the grace of God effected his conversion (about the year 34 A.D). After receiving baptism and making some initial attempts at preaching, Paul withdrew into the Arabian desert (c. 34-37 A.D.), where he prepared himself for his future mission. During this retreat he was favored with special revelations. Upon his return to Damascus he began to preach but was forced to leave when the Jews sought to kill him. Then he went to Jerusalem "to see Peter." Barnabas introduced him to the Christian community, but the hatred of the Jews again obliged him to take secret flight. The following years (38-42 A.D.) he spent at Tarsus until Barnabas brought him to the newly founded Christian community at Antioch, where both worked a year for the cause of Christ ; in the year 44 he made another journey to Jerusalem with the money collected for that famine stricken community. The first major missionary journey (45-48) began upon his return as he and Barnabas brought the Gospel to Cyprus and Asia Minor (Acts 13-14). The Council of Jerusalem occasioned Paul's reappearance in Jerusalem (50). Spurred on by the decisions of the Council, he began the second missionary journey (51-53), traveling through Asia Minor and then crossing over to Europe and founding churches at Philippi, Thessalonia (his favorite), Berea, Athens, Corinth. He remained almost two years at Corinth, establishing a very flourishing and important community. In A.D. 54 he returned to Jerusalem for the fourth time. Paul's third missionary journey (54-58) took him to Ephesus, where he labored three years with good success; after visiting his European communities, he returned to Jerusalem for a fifth time (Pentecost, 58). There he was seized by the Jews and accused of sins against the Law. After being held as a prisoner for two years at Caesarea, he appealed to Caesar, was sent by sea to Rome (60 A.D.). Shipwrecked and delayed on the island of Malta, he arrived at Rome in the spring of 61 and passed the next two years in easy confinement before being released. The last years of the saint's life were devoted to missionary excursions, probably including Spain, and to revisiting his first foundations. In 66 he returned to Rome, was taken prisoner, and beheaded a year later. His fourteen letters are a precious legacy; they afford a deep insight into a great soul. 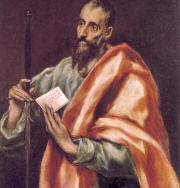 St.Paul’s series of Epistles is an important source of doctrine for the Holy Church. In the Holy Qurbana which is the Queen of the Sacraments of the Holy Church, one of the readings from the Scriptures is always from a Pauline Epistle.